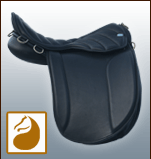 To make the position of your saddle and the comfort for your horse as complete as possible, we advice to use our anatomical girth; this girth is ergonomically designed to especially accommodate horses with a forward girth groove. But also horses with girthing problems react very positive on our girth. The girth releases the pressure on the sternum and the pectoral muscles. 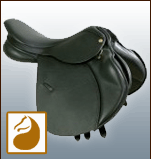 Measuring a saddle requires expertise and craftsmanship; we therefore advise to have your saddle fitted by a professional saddle fitter.